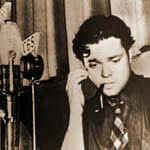 The Campbell Playhouse was a drama series created by Orson Wells after the spectacular notoriety gained by his Halloween 1938 broadcast of War of the Worlds. Quick to ride the surge in interest was Campbell Soups, which sponsored the show from its inception on December 9, 1938 to June 13, 1941. . Known for its high quality, Campbell Playhouse lasted longer than most high-budget productions due to the fame of its founder. It offered hour- long adaptations of well-known plays and novels, as well as popular movies. The end came one year after Wells high tailed it to Hollywood and the start of his movie carrier with RKO Radio Pictures in 1940. The final broadcast of The Campbell Playhouse was on June 13, 1941.